Tokyo Electric Power Co. announced completion Monday of a 780-meter coastal wall along the heavily damaged reactor buildings of the Fukushima No. 1 nuclear power plant. Tepco hopes the wall will significantly reduce the amount of contaminated water that has continued to flow into the Pacific more than four years after the 2011 meltdown crisis. The gigantic wall, which the utility describes as impermeable, has an underground section that reaches as deep as 30 meters. 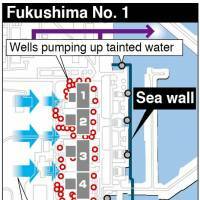 It will reduce the amount of tainted water flowing into the sea from 400 tons to 10 tons a day, according to Tepco’s estimate. 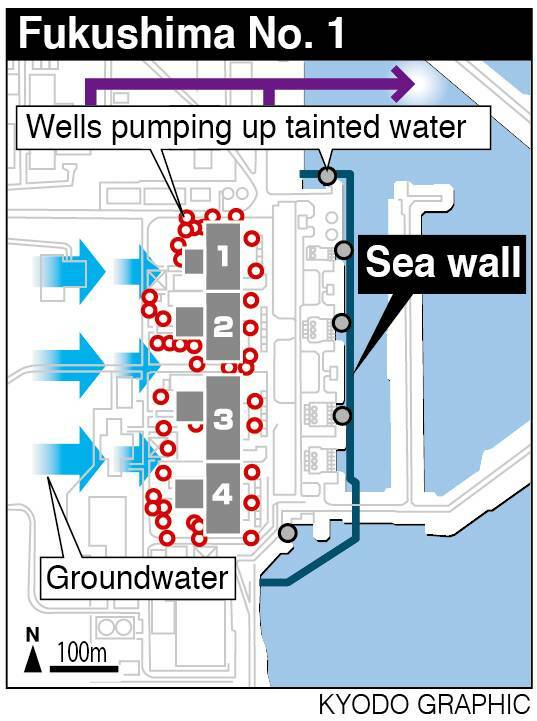 Until Monday, about 400 tons of groundwater was draining along the sides of the buildings and into the sea each day, after being contaminated with fallout from the 2011 meltdown crisis, according to Tepco. The utility says an estimated 150 tons of underground water is still flowing into the basements of the damaged reactor buildings each day. The water, some of which has been circulated to cool melted nuclear fuel, is believed to be kept in place within the buildings by pressure exerted by higher underground water levels outside the buildings. Last month, Tepco, after finally securing the consent of the local fishing industry, started draining underground water from around the plant buildings and dumping it into the sea after subjecting it to decontamination processes. The launch of this draining operation put Tepco in a position to close the wall’s last 10-meter opening Monday. 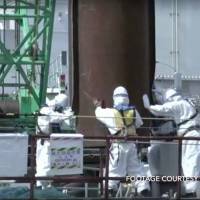 The wall is now expected to reduce the amount of radioactive cesium and strontium entering the sea to one-fortieth of previous levels, and that of tritium to one-fifteenth of the previous levels, Tepco officials claimed. 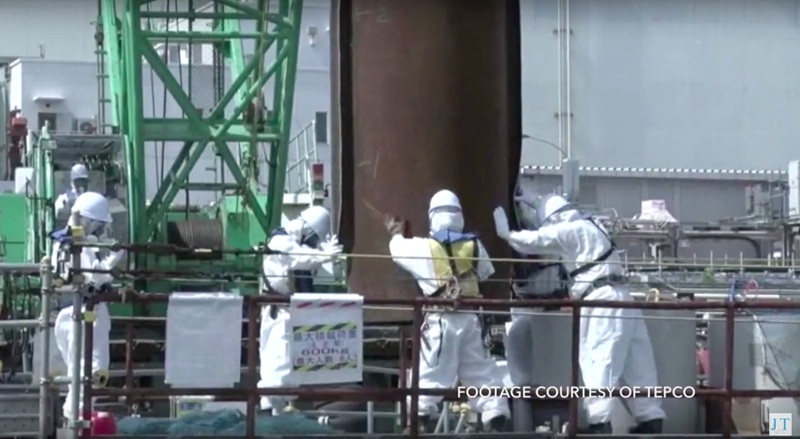 Around 10 a.m., plant workers drove nine 30-meter steel pipes into the ground and injected mortar to fill the gaps between them, thereby closing the wall and mitigating the leakage of what Tepco calls “slightly tainted water” into the sea. Recent tests of water samples from the nearby sea have detected radioactive substances such as cesium-137 and strontium-90, but scientists have said the density is so low that it poses no immediate danger to human health. Yet, the ongoing flow of tainted water from the plant has raised anxiety and concerns among local fishermen and many consumers across the country. Tepco plans to keep monitoring the density of radioactive materials in the nearby sea over the next month. To isolate the four reactor buildings from the underground water, Tepco hopes to freeze the soil around them by the end of this year with coolant equipment already buried in the ground. The Nuclear Regulation Authority has yet to give permission for the operation, saying creation of frozen soil could drastically change the underground water level around the plant. If the water level outside falls lower than that inside, the contaminated water could leak out. Meanwhile, Tepco has not explained exactly how it will control the water levels, an NRA official said.